High Court of Punjab and Haryana at Chandigarh has given notification of 14 Private Typist Vacancies. The interested candidates can apply for Punjab and Haryana High Court Recruitment 2019 on or before 05.03.2019. 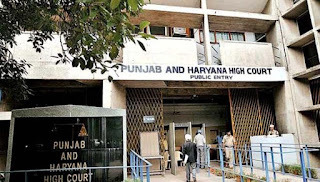 Chandigarh High Court Recruitment 2019-20 of Typist notification is out. 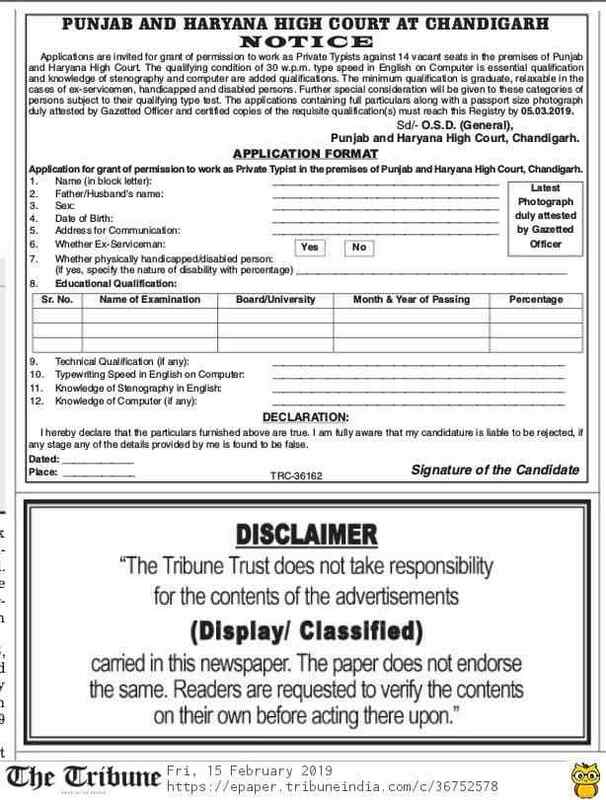 As per the Notification, there are 14 Private Typist Vacancies. The educational qualification is the Graduation degree. The age limit is as per the court rules. If you are looking for Typing Jobs in Punjab & Haryana High Court at Chandigarh then this article is going to be very helpful for you. Educational Qualification: The minimum qualification for the Private Typist Vacancy is the graduation degree. The qualifying condition of 30 words per minute type speed in English on the computer and knowledge of stenography and computer are added qualifications. Age Limit: The age limit is as per the department norms. Salary: As per the Punjab and Haryana High Court norms. Selection Process:The selection is going to be on the basis of typing test. Important Dates: Last Date: 05 March 2019. Result: You can check the Punjab & Haryana High Court Private Typist Result or Interview List from the official website. High Court of Punjab and Haryana at Chandigarh has given notification of 352 Clerk Vacancies on behalf of the District and Session Judges of the State of Haryana. The interested candidates can apply for Punjab and Haryana High Court Recruitment 2019 on or before 07.02.2019. Chandigarh High Court Recruitment 2019-20 of Clerk notification is out. As per the Notification, there are 352 Clerk Vacancies. The educational qualification is the Graduation degree. The age limit is 18 to 42 years. If you are looking for Clerical Jobs in Punjab & Haryana High Court at Chandigarh then this article is going to be very helpful for you. The candidate should have a degree of Bachelor of Science or Bachelor of Arts (BA) or any equivalent qualification. The candidate should have passed the matriculation with Hindi as one of the subjects. Note: The candidates/ applicants possessing any graduation degree (i.e. Arts, Science, Commerce, Computer) or equivalent thereto is eligible. The minimum age limit for the PHHC Clerk Job is 18 years and the maximum age limit is 42 years for the general category candidates. SC/ST of Haryana: 18 to 47 years. BC of Haryana: 18 to 47 years. ESM of Haryana: 18 to 42 years plus continuous military service added by 03-years. Widow: 18 to 47 years. In Service Employees: 18 to 45 years. The salary to the selected candidates will be given as per the latest Haryana Govt. rules. The application fee for SSSC Haryana Vacancy is non-refundable. You can deposit the application fee by the way of “Cash Deposit Receipt” printed after completion of the 1st step of registration at any SBI Branch. General: Rs. 750/- for male and Rs. 375/- for the female candidates. SC/ ST/ BC/ ESM of Haryana: Rs. 200/- for male and Rs. 100 for the female candidates. Reserved Categories of Other States: Rs. 750/- for male and Rs. 375/- for the female candidates. PWD & Dependants of ESM: As per their original category. The candidates can apply for the Punjab and Haryana High Court Clerk Vacancy in 02-Steps. The Registration Step-I and the Registration Step-II through the official website at www.sssc.gov.in by clicking at the button “Clerk (Subordinate Courts of Haryana)”. You can check the Punjab & Haryana High Court Clerk Result or Interview List from the official website. Admit card for the provisionally eligible candidates will be uploaded on the official website. The candidates will also receive Emails/ SMS in this regard. Here we are going to provide you the links to download Punjab & Haryana High Court Clerk previous year question paper pdf files with answers. You can check the examination pattern with its help and you can score well during this exam. High Court of Punjab and Haryana, Chandigarh has given notification of 01 Assistant Librarian Vacancy by the way of direct recruitment. The interested candidates can apply for Punjab and Haryana High Court Recruitment 2018 on or before 15 July 2018. Chandigarh High Court Recruitment 2018-19 notification is out. As per the Notification, there is 01 Assistant Professor Vacancy. The educational qualification is the Master’s/ Bachelor’s degree in Library Science. The age limit is 18 to 27 years. If you are looking for Jobs in Punjab & Haryana High Court at Chandigarh then this article is going to be very helpful for you. The candidates should have passed graduation or post-graduation degree in Library Science or an equivalent professional degree with a consistently good academic record. 18 to 27 years as on the last date of application (i.e. 15.07.2018). For candidates belonging to the SC/ST/BC category, the upper age limit will be relaxed by 03-years. Physically Handicapped: 10 years over and above the prescribed upper age limit. Ex-Servicemen: By the number of years equal to his defense service for up to 3 years. Rs. 10300-34800 Pay band and 4400 gross pay. The high court may shortlist the candidates on the basis of interview. Ex-Servicemen and PWD: Rs. 200/- by way of Bank Draft/Crossed Indian Postal Order payable at Chandigarh in favor of the Registrar General, Punjab, and Haryana High Court, Chandigarh. You can submit your application on the prescribed form duly filled in along with the self-attested copies of the relevant testimonials and two passport size photographs in the Coordination Branch (Receipt and Dispatch), Punjab and Haryana High Court, Chandigarh, 160001 on or before 15.07.2018 on any working day up to 05.00 PM. Kindly mention “Application Form for the Post of Assistant Professor” on the application envelope. Last Date: 15 July 2018. 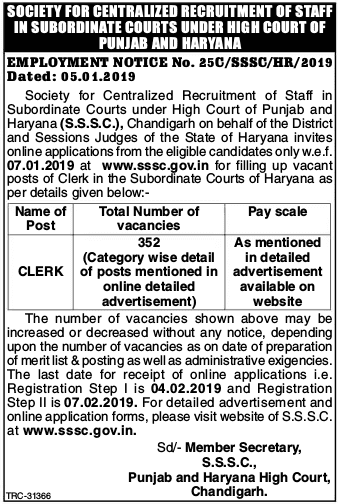 High Court of Punjab and Haryana at Chandigarh, Society for Centralized Recruitment of Staff in Subordinate Courts (SSSC) has given notification of 39 Clerk, Stenographer Grade III, and Driver Vacancies. The interested candidates can apply for Punjab and Haryana High Court Recruitment 2018 on or before 04 May 2018. High Court Chandigarh Recruitment 2018-19 notification is out. As per the Notification, there are 39 Clerk, Stenographer Grade III, and Driver Vacancies. The educational qualification for SSSC Punjab Notification is middle pass and graduate degree. The maximum age limit is 18 to 37 years. If you are looking for Driver, Clerk and Steno Jobs in Chandigarh High Court then this article is very helpful for you. Clerk: The candidates applying for Clerk Post should have passed the graduation degree. Steno: Graduation and should have proficiency in operation of computers. Driver: Middle Pass with Punjabi/Hindi as one of the subject. The candidate should have a valid license for L.T.V with 02-years of experience of driving a car. Clerk 10300-34800 + 3200/- Grade Pay. Stenographer Grade 3 10300-34800 + 3600/- Grade Pay. Driver 5910-20200 + 2400/- Grade Pay. 18 to 37 years as on 01.01.2018. Clerk: On the basis of written examination of General Knowledge and English Composition of 50 marks each. After written examination, the selected candidates will be called for computer proficiency test (CPT). The CPT will comprise of 02 sections Word Processing test and Spread-sheet test. Stenographer: On the basis of the shorthand test and its transcription at the speed of 80 words per minute and 20 words per minute respectively. After shorthand test and computer proficiency test, the candidates will be called for checking of original testimonials. Driver: In the case of a large number of candidates an objective type written test of GK & Awareness, knowledge of traffic signs/rules and driving skill question may be taken. The shortlisted candidates will be called for the practical driving test. Note: The candidates can deposit the fee (non-refundable) by way of “cash deposit receipt” printed after completion of Step-I registration in any branch of State Bank of India (SBI). The method to apply for PHHC Chandigarh Vacancy is online. There will be two steps for applying online application Step-I and Step-II. You may also read the official advertisement notification for more useful information. Online Applications Starting From 02 April 2018. Last Date for Registration of Step-I 01 May 2018. Last Date for Receipt of Application Fees 03 May 2018. Step-II Registration Last Date 04 May 2018. Last Date for Editing of Applications 04 May 2018. Date of Written Examination May to August 2018 (Tentative).